The term periodontal is the scientific word for gums. Essentially, gum disease is the common term that people use for periodontitis. Instead of focusing on the difference of these two terms, it is better to focus on the stages that people go through whether they call it periodontitis or gum disease. The cause of the disease is the bacteria that surround the teeth and gums. The reason that people brush their teeth, floss and go the dentist regularly is to keep the teeth and gums as free of bacteria as possible. Allowing the bacteria to grow will result in plaque, tartar and gum or periodontal disease. The first stage of periodontal disease is gingivitis. This is a relatively common problem that is easily treated and reversed with proper care. The next stage is periodontitis. 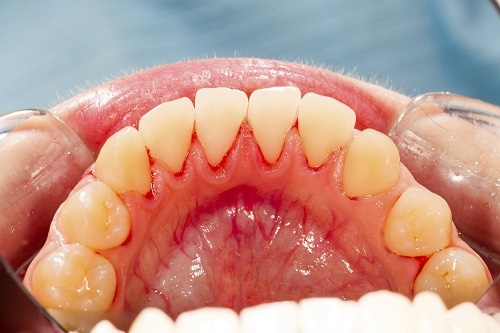 During this stage, pockets form in the gum and the gums begin to recede. The pockets and receding gums associated with periodontitis allows bacteria to get into the bone and the jaw resulting in the loss of more tissue and bone. Periodontitis and gum disease are interchangeable, and it is important for people to recognize the danger of any dental issues. Like many other medical conditions, the sooner a person treats a problem, the easier it is to fix it and repair the damage. Ignoring the signs of oral health issues is a sure way to having more problems later on. If you want more information about how to care for your teeth and to avoid the problems of gingivitis, gum disease and periodontitis, please contact the professionals at our office. We will help you in any way you need.